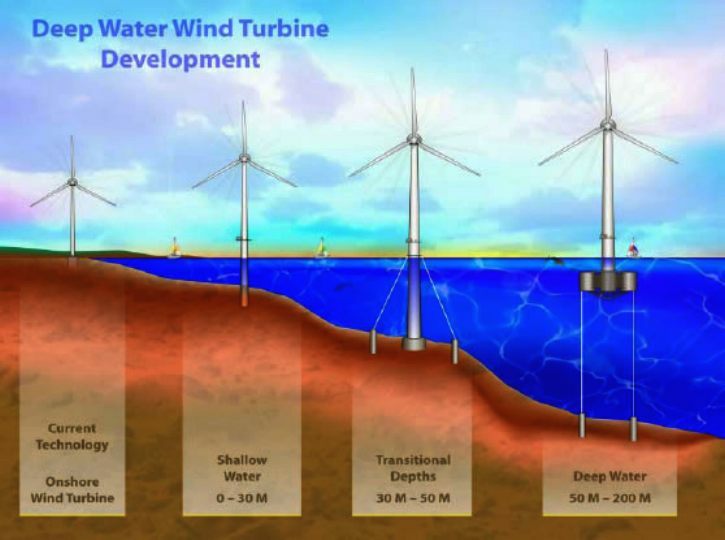 Offshore wind energy involves construction of wind turbines in the marine environment. Offshore turbines are more expensive than onshore developments, although costs continue to fall, but provide greater options in regard to potential scale in terms of both numbers of turbines and the size of the individual turbines. Devices can be fixed to the seabed or floated on the water surface. Floating turbine technology is however still developing and costs remain higher than fixed devices. Fixed devices are however limited by water depth and therefore have to be situated in areas of shallow water (less than 50m). Wind energy is the most mature of the marine resources and is currently the most cost competitive. recent tenders in northern Europe have been at very competitive prices. RET continues to investigate the potential for offshore wind energy considering not only generation potential but also public opinions and potential impacts (social, economic and environmental).